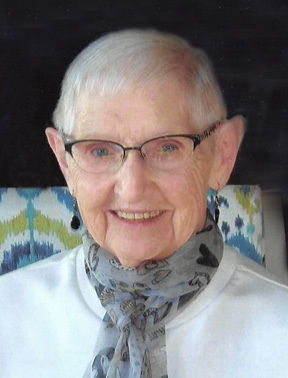 Elaine Kidder, 86, of Fergus Falls, passed away peacefully on Thursday, November 29, 2018, at PioneerCare in Fergus Falls following a long, courageous battle with cancer. Her strength and determination were an inspiration to all who knew her. Elaine Frances Fiedler was born on November 19, 1932, in Perham, Minnesota, the daughter of Constant and Sophie Josephine (Liefermann) Fiedler. She was baptized and confirmed at Sacred Heart Catholic Church of Dent. Elaine attended country school district #223 and graduated from Perham High School in 1950. She married the love of her life, Stanley E. Kidder on June 4, 1953 at Our Lady of Victory Catholic Church of Fergus Falls. The couple farmed in rural Fergus Falls. Elaine also worked at The Ranch House, Norby’s, served as bookkeeper of St. Elizabeth Catholic Church, and worked in the SunMart Deli after retirement. Her devotion to the church was shown by her membership in St. Elizabeth Catholic Church and St. Elizabeth Christian Mothers. She was also a member of VFW Post Auxiliary #612 and the drill team. Her hobbies included watching all sports events especially any that involved her grandchildren. Her joys included cooking, baking (she was renowned for her Sally Ann Cookies), canning (making and sharing her raspberry jam with those she loved), embroidery, puzzles, going to casinos and playing cards. She especially enjoyed entertaining her family and friends. In addition to her parents, she was preceded in death by her husband, Stanley; great-grandson, Carter Hauge; four siblings, Bernice Waldorf, Irene “Sally” Harthun, Lawrence Fiedler, and Vernon “Buster” Fiedler; brothers-in-law, Ralph “Pete” Harthun and Joe Waldorf; sisters-in-law, Delores Fiedler and Marlene Fiedler. She is survived by her four children, June (Kevin) Clark and Byron (Marsha) Kidder all of rural Fergus Falls, Wanda (Dave) Zimmerman of Elizabeth and Judy (Kevin) Hauge of Fargo; 13 grandchildren, Amber (Bill), Mindy (Jason), Kristin (Glenn), Kyle (Gabrielle), Spencer (Jenna), Darin (Leah), Lauren (fiancé Dillon), Matthew, Brandon (Kayla), Brittany, Brady (Jackie), Scott and Ross; 10 great-grandchildren, and one on the way; two sisters, Christine Warzecha of Monticello and Marion (Joe) Jaroszewski of Dent; one brother, Raymond Fiedler of Wheaton; along with numerous nieces, nephews, cousins and a host of friends. Visitation: 4:30 – 7 PM Wednesday, with a 6:30 PM Rosary led by the Christian Mothers, followed by a Prayer Service at Glende-Nilson Funeral Home, Fergus Falls, resuming one hour prior to services at the church.